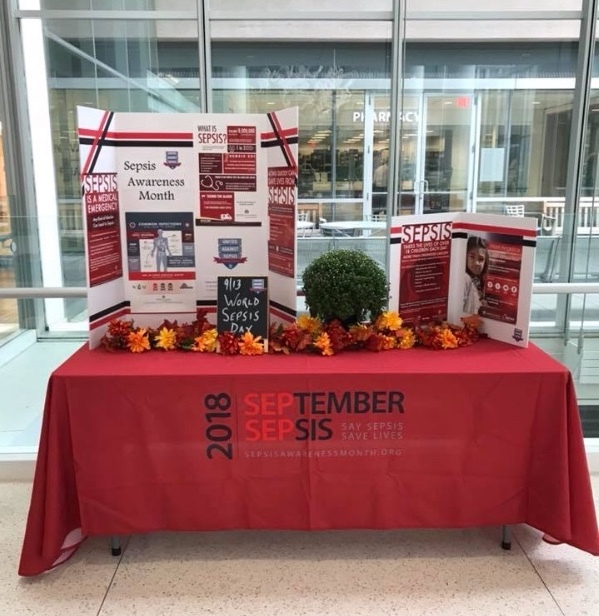 We are happy to report we had an amazing Sepsis Awareness Month and share our October newsletter. 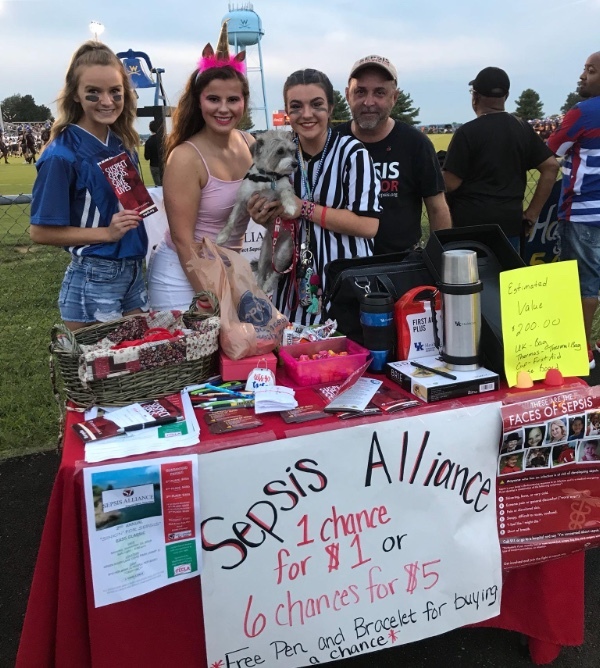 This monthly newsletter gives you a small taste of what is happening at Sepsis Alliance. Keep reading for our Sepsis Awareness Month recap, upcoming webinars and events, and more. 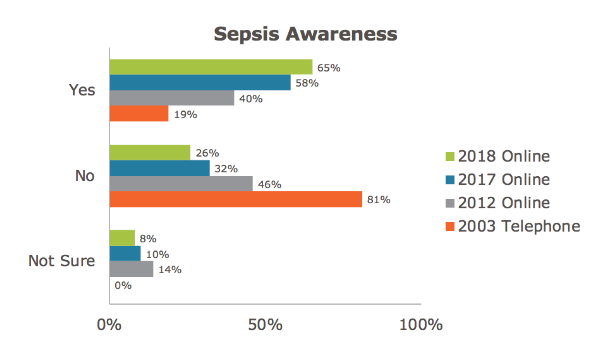 Sepsis Alliance’s annual sepsis awareness survey, conducted by Radius Global Market Research, reveals awareness of the condition reached a new high, with 65% of U.S. adults reporting they have heard the term sepsis, compared to 44% four years ago. The first sepsis awareness survey was conducted by phone in 2003 and found that 41 million (19%) U.S. adults knew the term. Today, 156 million (65%) U.S. adults know the term. We’ve made great progress! However, the survey results also show that sepsis symptoms are not well known and there is a lack of urgency in seeking medical attention. Only 12% of adults know the most common symptoms of sepsis and just half strongly agree that you need to seek medical attention if you see signs of sepsis. To read the full report click here. Our study reveals that there is much to cheer about yet much more work to be done. To read about our Sepsis: It’s About Time™ campaign click here. Spreading It’s About TIME™ Across the Country! Thank you to everyone who supported the launch of our Sepsis: It’s About Time™ national billboard campaign. 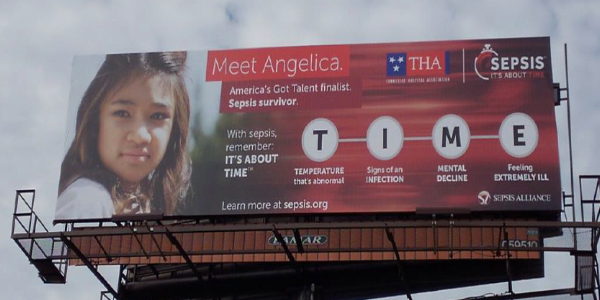 We are excited to share that billboards, featuring the TIME acronym and Angelica Hale, have gone up in cities across the country, including Columbus (OH), Los Angeles, Memphis, Des Moines and Rockledge (FL) just to name a few. If you see one, let us know by sending a picture to info@sepsis.org or tagging us on social media @SepsisAlliance. 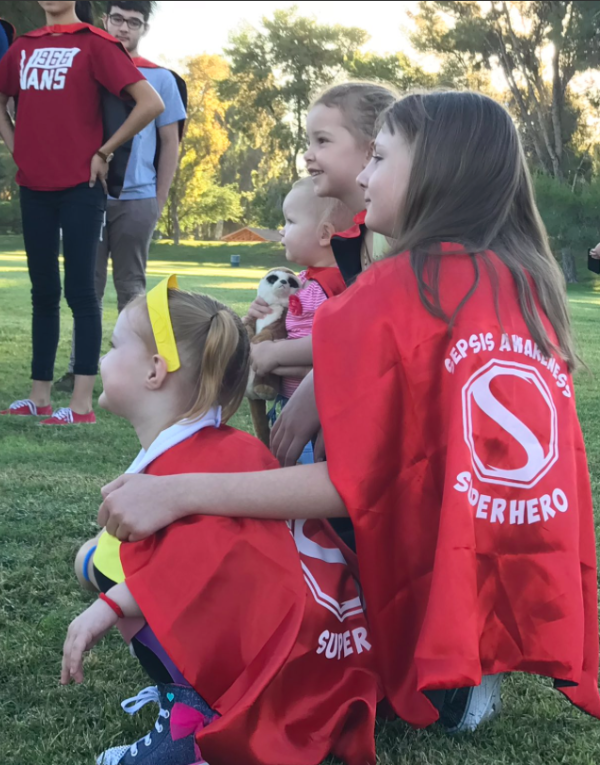 On September 13, 2018, Sepsis Alliance raised $250,000 at the 7th annual Sepsis Heroes gala, while honoring passionate individuals and innovative organizations dedicated to raising sepsis awareness and improving treatment of sepsis. To read more click here. At the gala, sepsis survivor and Erin Kay Flatley Spirit Award winner Angelica Hale debuted her new song, No Time to Waste, which she penned about overcoming life’s trials. She was inspired by her personal experience surviving sepsis when she was only four years old. To listen to No Time to Waste, click here. and performing No Time To Waste. 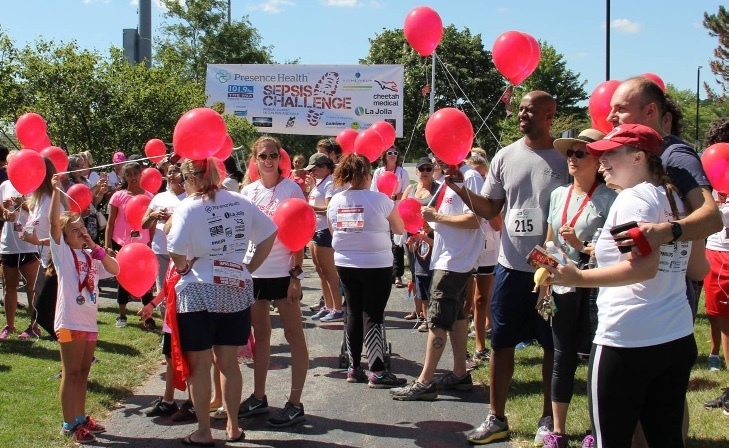 166 Superheroes joined our 2nd annual Sepsis Awareness Superhero Challenge! 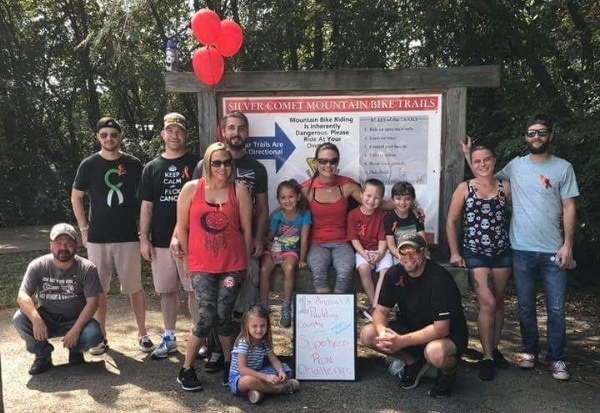 Together they raised sepsis awareness nationwide and $23,000, along with a generous $15,000 matching gift from our board, for a total of $38,000 for sepsis awareness programs, resources, and education. Did You Feel the Sepsis Awareness Month Spirit? Check out the video below. To read more about Pamela and what inspired the video, click here. 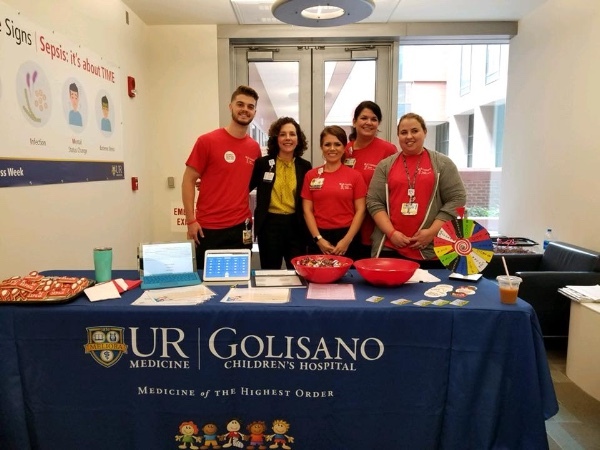 Elise and her daughter raised sepsis awareness at Golisano Children’s Hospital. 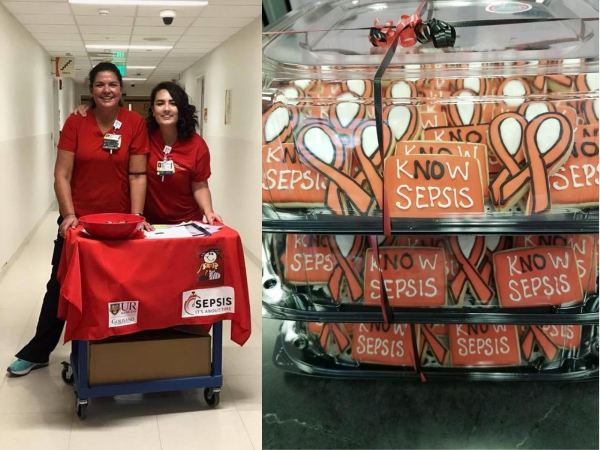 They even provided Sepsis Awareness cookies for the staff! 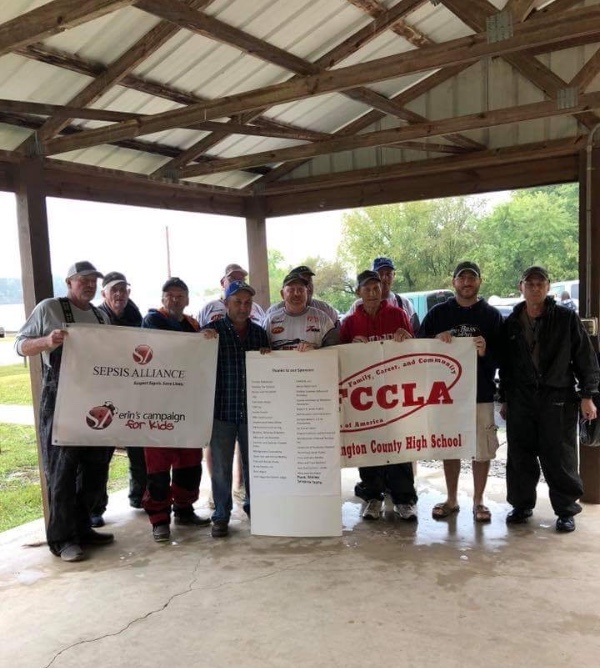 Sepsis survivor and advocate Darrell Raikes held a fishing tournament and had a booth set up at his local football game. 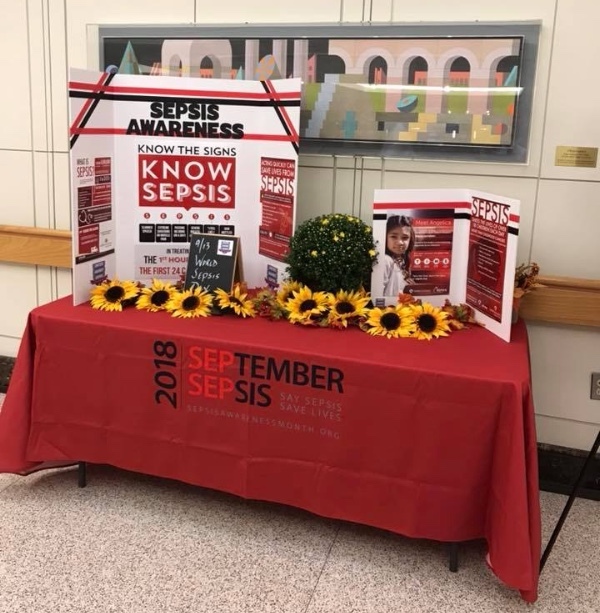 The displays were created by members of the Hospital of University of Pennsylvania: PENN Medicine Sepsis Alliance and the Hospital of University of Pennsylvania Nursing Coordinator Group/Rapid Response Team. 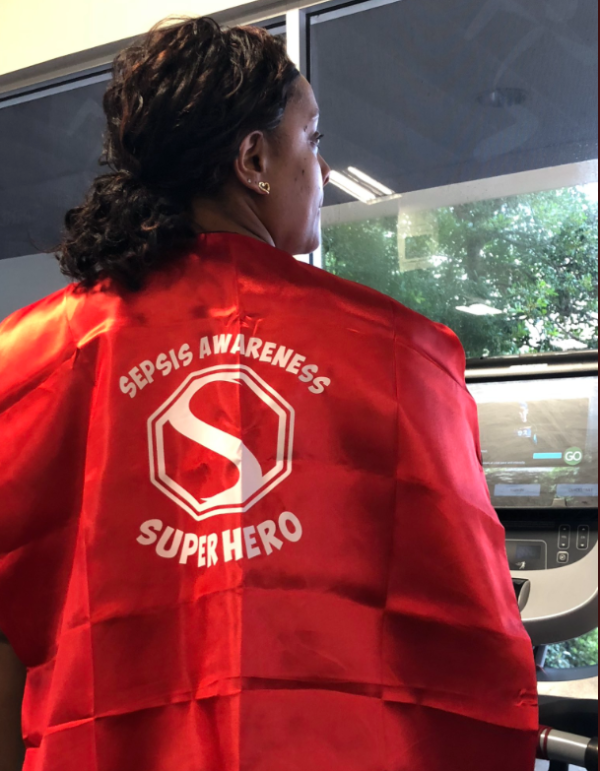 During the month of September, Sepsis Alliance team members shared their personal sepsis experiences and educated healthcare professionals about sepsis at more than half a dozen conferences, webinars and events! 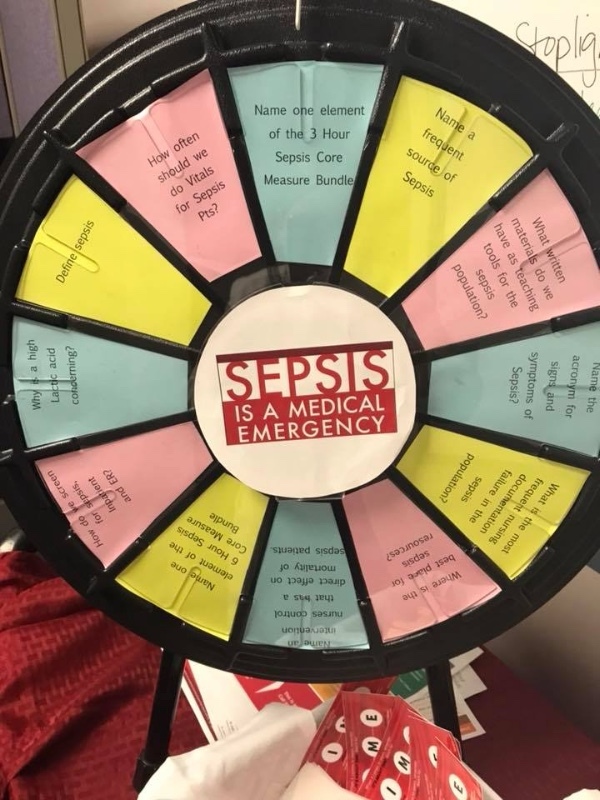 “The very fact that we had the opportunity to spread our message at so many events, from Philadelphia to Sacramento, for a variety of healthcare professionals is a reflection that sepsis awareness is growing and that the healthcare community is taking it seriously,” said Thomas Heymann, Sepsis Alliance Executive Director, who presented at four events. 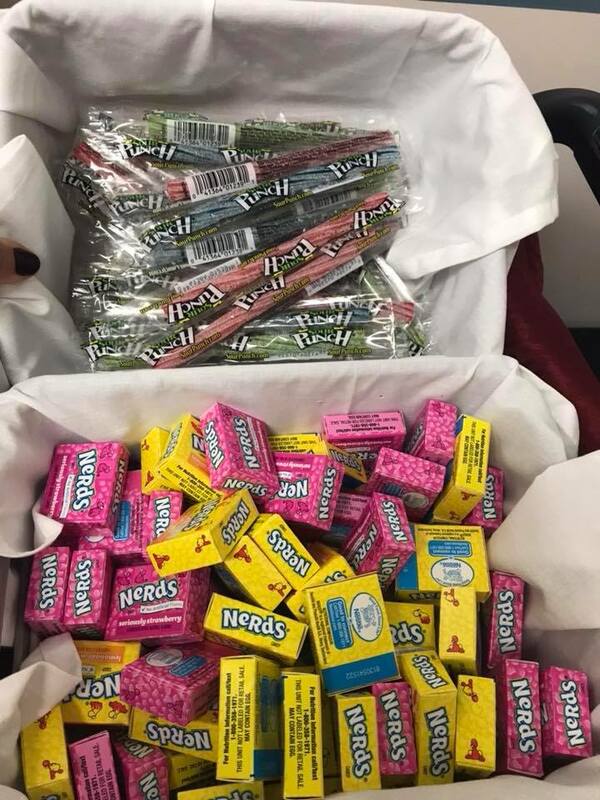 That’s one presentation a week. Join us for a webinar on the integration of infection control and antimicrobial stewardship with sepsis initiatives. The webinar will be led by Cindy Hou, DO, MA, MBA, FACOI, Infection Control Officer, and Marianne Kraemer, RN, MPA, Ed.M, CENP, CCRN-K. Chief Nursing Officer, from Jefferson Health. To stay up-to-date, please visit www.sepsiswebinar.org. 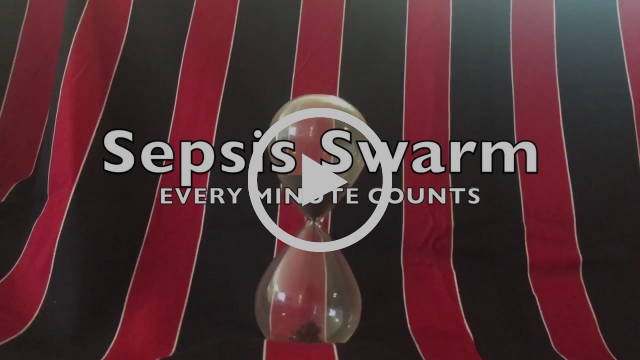 Sepsis Awareness Month is over but you can still raise awareness! To learn how, visit www.sepsis.org/get-involved/.